CBS is a weird network-they drop all their decent TV shows, but then they show these clearly floppable movies. But, this review is not on CBS, rather a movie that I saw years ago that I seriously thought nothing of until I saw it here on Amazon. 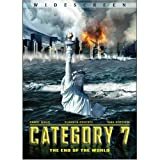 I never saw Category 6 (the preceding story), but Category 7 is a disaster flick about a large storm laying seige to just about everything. Due to various reasons, this superstorm has intensified to one of the highest categories possible, meaning it will obliterate whatever it passes over. It is essentially up to scientists, government officials, and a wacky storm chaser to find a way to stop it before imminent disaster parks itself over Washington D.C. This movie was shown in a two-parter on CBS in 2005 and the only reason I ever heard about it is because of CBS's intense radio and television commercials. Simple curiosity prompted me to record it and watch later. In short, this movie was a major disappointment. The acting was horrible, the dialogue must not have been proofed at all, and the characters were hardly memorable (well, ok, the Tornado guy was a little bit, simply because of his goofy nature, but only him). Aside from science that is a little far-fetched to ever consider possible, this movie just got to be a little too much. It's sad, because I grew up on the disaster TV movie genre, which are naturally prone to campy acting and low-budget special effects, but even this one fell short. In summary, if you're a person who loves over-the-top disasters, cheesy characters, and a plot line controlled by excessive action sequences, then this might be your movie. My only reason for giving it 2 stars rather than 1 is because I feel this movie had a chance of being better if it had more money in its budget. This is bad. Really bad. For a made-for-TV movie, the special effects are decent, but the story is more than laughable. It's beyond ridiculous. I never knew you stop a tornado by turning off your lights. Furthermore, I never knew a person could stand against tornado-strength winds while cars and SUVs blow by him. Finally, I still can't figure out what the point of all the dumb sub-plots was. This hollow theme never did explain why an hour out of the three was wasted on a foiled kidnapping. This is another story that tells us if we simply go green that hurricanes, tornadoes and other violent storms will just abate. I'm sure this is real. I mean, it was on TV, wasn't it? They turned out their lights, and the Category 7 storm just...disappears. Amazing! Go Al Gore! Again, this was purchased as a present so can't say if it's good or bad. LOL.. When will this ever end...? Category 1, then 2, 3,4,5,6 and now 7..? I wonder what kind of "super-duper" storms we will see in Category 8, 9, 10... 34... 98. Overall, as long as the expectations are approporiate, it is a nice little mini-series I'd probably watch again during some other forced lull in life.